This tribute to Dalit activist Rohith Vemula was written one year ago, January 17th, on the first anniversary of his suicide. Suicide is common among oppressed castes as it is among all oppressed people. I repost it to commemorate his life & so that we may better understand the social character of most suicides when inequality & injustice make life unbearable to sensitive human beings. It is not a weakness to defy the instinct for survival in order to quell the suffering we cannot endure. It’s been one year today since Rohith Vemula took his own life. The loss of someone to suicide is a grief filled with questions that cannot be answered, confusions over what might have been, guilt and recriminations about who’s at fault and what could have been done to prevent it if only we’d known. In the end, it was his decision long in the making that he, “a glorious thing made up of star dust,” as he so beautifully described human beings, could not live without the freedom of spirit he needed so burdened was he with the dead weight of inequality. We may grieve for a very long time but we have to trust he understood something about himself that he would not let others see: “My birth is my fatal accident. I can never recover from my childhood loneliness. The unappreciated child from my past.” That spiritual melancholy he expressed so poignantly is the isolation and humiliation of oppression, of being disrespected and looked down upon for who you are. It is human beings, so strong and yet so vulnerable, who bear the weight of social and political inequality which devour the soul & sometimes exhaust the psychic energies to resist them. He was a man keenly sensitive to nature, human love, pain, life, death, and the distinctions between the sincere and artificial. The sensitivity and insight are what made him a fighter and yet kept him so vulnerable. Oppression weighs heavier on some, on the thinkers, the ones who care about others the deepest. But for himself, he felt empty and believed in others more than he believed in himself. He gave others respect because he knew its value and its power and probably never understood his own. Those are the confusions that come from inequality. No one holds education in greater esteem than the oppressed, not as a matter of status but of empowerment, and there are remarkable stories of the lengths the oppressed have gone just to learn. Intellectual aspirations are discouraged, often mocked, and always made difficult to achieve by those in power. That’s why in US history, it was newly freed slaves in the south who first introduced free public education available to all. 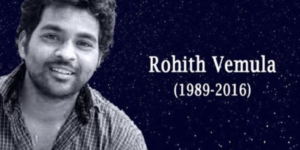 Rohith was a naturally intellectual person, curious and eager to understand. University officials probably well understood that about him and detested that in him, which is why they took away his stipend and suspended him. It was the place they knew he was most committed and therefore most vulnerable. That makes them culpable in his death. He was an embodiment of what Gramsci awkwardly called the “organic intellectual.” His intellectual commitments derived energy from being oppressed and from identifying with his caste. His unique ability to educate and inspire others was because he did not place himself above them nor seek to rise above others but only to rise with the oppressed to end inequality once and for all. We shall always regret the choice he made in death though we trust he knew best when he had reached the limits of his endurance. We wish we could tell him we would never judge him selfish, stupid, or a coward as he thought but will always honor the choices he made in life to stand resolutely against inequality and thus be part of ending it. When asked what could Rohith Vemula possibly mean to an American socialist and activist the answer is, the same as he means to Dalits and other oppressed castes. He was one of ours, he stood with us, fought for us and with us, believed in our capacities to change the world. For that we honor him. May he Rest In Peace, at one now with the star he came from. This is such an important article addressing the psychological trauma of Palestinians under occupation. It of course applies also to Kashmiris, Rohingyas, Uyghurs, Blacks, Latinos, & Native Americans in the US, indigenous peoples facing genocide as in Latin America, Africa, North America, Asia, & South Asia. Sustaining profound psychological trauma is a human, sane reaction to oppression & daily violence & should not glibly be described as mental illness. There is nothing better than an uncompromising polemicist & the Kashmiri struggle against occupation & for self-determination has produced quite a few of them. This article by Parvaiz Bukhari addresses how India is trying to manipulate the Intifada of Kashmiri youth through a born-again politician. Its insights are quite applicable to how the Democratic Party manipulates the lesser evil con game in US politics. How come so many people are dumping me? Couldn’t be my halitosis since none of them are close enough to know. Is it my politics? Those won’t change. Or is it my smart mouth? That’s beyond redemption. No hard feelings because I have nearly 500 friend requests from people I would love to collaborate with. Thank you to my Facebook friends who continue to bear with me. There’s no question that the term “Islamophobia” is an awkward one. 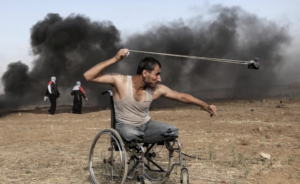 In a recent discussion, Javed Hassan pointed out its inadequacy, saying: “It is translated into killing Muslim children from Kashmir through Burma, Syria, Iraq, Yemen, to Palestine.” We might also add from Bosnia, Chechnya, the Philippines, Sri Lanka, Thailand, Cambodia, India, China, to the Central African Republic & elsewhere. Unfortunately, awkward or not, that is the term now used for the new Cold War against Muslims–although the persecution is not new at all, not by a long shot. It’s important for us to study why Muslims are targeted. In some places it’s ethnic, some places it’s religious, in other places (like Egypt, Yemen, Bahrain, Syria, Palestine, Kashmir, Burma) it’s because those Muslim-majority places have shown the most powerful resistance to tyranny & foreign control. Sometimes it is the legacy of colonialism. Standing with Muslims against persecution of any & every kind is the imperative in modern day politics. No concessions of any kind can be made to Islamophobia–or more aptly, as Javed pointed out, the hatred of Muslims. Canadian Prime Minister Justin Trudeau, who can drop a bucket of crocodile tears on cue, has reaffirmed his opposition to & condemnation of the Boycott, Divestment & Sanctions (BDS) movement against Israeli apartheid & genocide. According to him, “delegitimizing” & “demonizing” Israel violates “Canadian values.” Genocide against Palestinians must be right up his alley since Canada is so practiced at it in its treatment & dispossession of Native Americans. For those looking for the lesser evil Democrat in the 2020 elections, every single politician who has declared their candidacy is ardent, even strident, in their support for Israel–including support for making advocacy of BDS a felony & requiring a loyalty oath to Israel for employment & social services. This is no longer just a question of where you stand on Israeli apartheid & Palestinian justice. They’re messing with the Bill of Rights which is the only salvageable part of the US Constitution which is a slave owner’s document. By not standing up against these initiatives which violate free speech, we aren’t looking at a slippery slope but an avalanche that will bury the Bill of Rights. An essential part of protecting our rights is now yoked by over-zealous Zionists to Palestinian rights. In desperation, Zionists might have just made a fatal mistake by undermining the foundations of American democracy. In 2016, a Supreme Court decision made inroads against the 4th Amendment regarding illegal search & seizure. But of course these violations were already in practice in the Black community under the guise of the war on drugs. When Black teens were vilified as narco-terrorists, these violations were accepted as necessary for law enforcement. As far back as 1992, in an article on the fallacy of Black drug gangs & the demonization of Black teens, I pointed out that by not defending Black kids or opposing violations of the Bill of Rights in the Black community, we were headed for big trouble. That’s one of the reasons many Black activists in the US identify with the Palestinians who are also vilified as terrorists. Anyone interested in collaborating with me to begin that process can message me or contact me at: mscully9@msn.com.